We are pleased to release the second Advocacy 2.0 Guide: Cross-posting for Advocacy, An Introduction to Effective Social Media Integration. 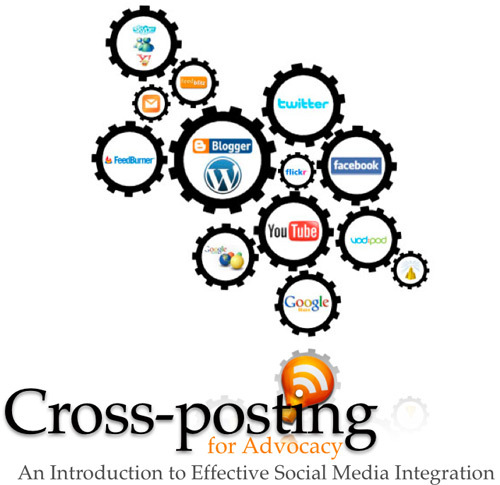 This guide offers us a brief introduction to how to use cross-posting for online advocacy campaign. It reviews different web 2.0 tools, showcasing successful examples where cross-posting has been used for advocacy. The guide also includes the pros and cons of the cross-posting technique. A successful and effective online campaign engages a variety of strategies in order to, on the one hand, raise awareness and promote a message, and on the other hand, to maximize outreach and attract new supporters driving them to take action in favor of your cause. Thanks to the incredible widespread availability of all kinds of content on the Internet, you can now increase the reach of your online campaign by automatically and instantly cross-posting your blog or website entries on different Web 2.0 services, such as macro and micro blogging services (Twitter, Facebook, Myspace, etc.). It is another fantastic way to build communication and connect to your audience, and it can have far-reaching impact on your campaign, particularly by getting the attention of people who have never visited your website. The entries on your blog and website are not separate entities. They can now appear on countless web platforms simultaneously, grabbing the attention of new niche audiences and opening new channels of communication with groups beyond the circle of your most loyal supporters. Your blog or website may remain your primary medium of choice for content, but since only some readers will follow you on Twitter or are subscribed to your RSS feed, this broad dissemination approach, has the potential to engage more people in your cause and encourage them to share links, sign electronic petitions, send emails, and even make donations. There are multiple benefits to this approach. The first is that you drive more visitors, and thus eventual supporters, to your own blog campaign. Also, it has the effect of lengthening the lifetime of your blog and website entries by generating a cycle of sharing and promotion that can be easily picked up by search engines like Google. Please download the guide as a PDF file and help us translating the guide in your language. – How to feed your blog or website to Twitter?